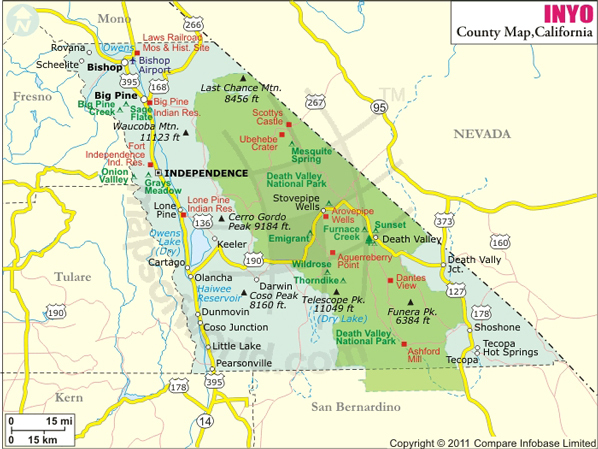 Below is County Map of Inyo in California showing the boundaries, roads, highways, towns and much more. Established in 1866, Inyo County is located in the Eastern Sierra in east-central California. Spanning an area of 10,227 square miles, Inyo is the second largest county in California. It has the lowest population density of any county in the state. The county seat is Independence and Bishop is the only city in Inyo County. The county covers the area to the east of the Sierra Nevada and southeast of Yosemite National Park. With an elevation of 14,505 feet, Mount Whitney is the highest summit in the contiguous United States. The Death Valley National Park, comprising approximately 3.3 million acres, is a land of extremes and superlatives. It is the hottest and driest of the US national parks. The Badwater Basin in Death Valley, at 282 feet below sea level, is the lowest point in North America. Owens Valley and the Sierra Escarpment are notable geographical features in the county that is known for magnificent natural diversity. The Eastern Sierra’s hidden alpine lakes in Inyo County are among California's top fishing destinations and the diverse rock formations of the Eastern Sierra are popular among thrill-seekers. Big Pine, Lone Pine, Shoshone, and Furnace Creek are significant census-designated places in Inyo County. US Route 395 is a major north-south highway in Inyo County, while State Route 190 traverses the Death Valley National Park.